Fitbit Ionic vs Apple Watch 2018: Which Smartwatch is the Best? Fitbit Ionic vs Apple Watch 3: Wich one deserves a place on your wrist? Introducing the first smartwatch from the leader fitness tracking company the Fitbit Ionic appears to be a real contender against the evolved Apple watch series 3. Including all the important features that make the Apple watch Series 2 a hit on the smartwatch world, the Ionic is not going out to the market without a fight. But the Apple watch series 3 is not a weak competitor with a long history and amazing app ecosystem the battle got real! Before we get into the review to choose which one is the better fit for your personal needs have in mind that the Apple watch need an iPhone to pair it with, something that the Ionic won’t face since you can use it with both iPhone and Android devices. When it comes to Apple they bring the ability to use the LTE something that is lacking on the Ionic, but is that a big factor? Keep reading and find out all that you will need to know to get the right smartwatch for you. 10 Which One to Buy? The Ionic is the first smartwatch from Fitbit and is the most feature-full tracker that the company has ever released. It addresses almost all the items on the Fitbit fans’ wish lists, particularly those who want more from the Blaze, Fitbit’s smart fitness watch. Just like all the Fitbit models, the Ionic is built for fitness. It comes with all the tracking functionalities and features that the other Fitbits sports, such as fitness tracking, sleep tracking, and heart rate monitoring. Is an overall amazing fitness tracker and its a great attempt into the smartwatch world. It not only has all the features that any Fitbit enthusiast will want but it also adds plenty of new features that make it an amazing smartwatch. The Series 3 is the updated version of the Series 2 and is similar when it comes to design and functions. They both include the same operative system called Watch OS 4 that comes with a lot of top notch updates for both models. Basically, the Series 3 is almost the same watch with some improvements when it comes to speed, performance, and tracking. So in case that the series 3 is a bit expensive for your budget you can get a pretty similar tracker for a better price (-$20 Less). With a market where every smartwatch looks just like another regular watch, Fitbit and Apple are the 2 companies that are still lunching tracker with a non-circular design. The Apple Watch 3 comes in 2 different sizes the smaller one is the 38mm that has a display with a 272 x 340 resolution and another 42mm model that includes a 312 x 390 resolution. Although different in sizes the display brightness is the same at 1000nits. A cool and unique characteristic from the Apple Watches is the rotating crown, that is a clever way of interacting with the screen without getting your fingers in the way of the display. The Fitbit Ionic sports a 1.42-inch touchscreen display with a 348 x 250 resolution that also goes up to 1000nits in brightness. The resolution also means that the screen is one of the sharpest of most smartwatches on the market. Instead of a rotating digital crown, the Ionic includes 3 hardware buttons flanking its display. Is available at 3 different colors with replaceable wrist straps that use quick release clips: Silver Grey body with Classic Blue Grey band; Smoke Grey body with Classic Charcoal band; and Burnt Orange body with Classic Slate Blue band. Then you can also choose the Adidas Edition that features a sports band in Ink Blue and Ice Grey with a Silver Gray aluminum case. When it comes to having an ecosystems Fitbit is one incredible platform that is full of apps, communities and so much more. They have also an app store but is called the ‘Gallery’. It started with apps from Pandora, Starbucks, Strava, and AccuWeather, but it was growing with time including apps likes The New York Times, Nest and more. But there’s no comparison with the real app store from Apple that has years of creating apps with a lot of choices to pick from, and it’ll take a while for Fitbit to catch up. The Ionic comes with 2.5GB of space for you to either store offline music from Pandora or from your own library; for those outside of the US Deezer will be the streaming option. But the Ionic doesn’t have cellular capabilities, you can’t stream music without your phone around. In the case of the Apple Watch they use third-party music services like Pandora and TuneIn Radio, and you can also sync your favorite playlists to your Watch for later listening standalone-style. In case you would like to sync over your music, you’ll have 8GB of storage to use, so is more than 3 times the capacity that the Ionic features. The Apple Watch it also a winner when it comes to the introduction of Apple Music on the LTE model, allowing you stream music on the go and without the need of carrying your phone. Although you will have to be on Apple’s music platform to use the LTE, there’s no Spotify support but it will let you stream those beats with no need of a phone. And you can also listen to the Radio app that lets you stream stations like Beats 1 and NPR. Both watches have the ability to pay right from your wrist. Apple Pay has been around for a while now and has been steadily building up its network of issuing banks and card providers all over the world. Although it doesn’t have a global coverage yet, it’s getting there and is one of the best options on today’s market for those that would lie to use a smartwatch to pay for things. Another advantage of the Apple watch is that you can use the Apple Pay Cash available on the Watch, that will let you easily send money to a friend. The Ionic comes along with the Fitbit Pay that is the company’s first try into the payments world, thanks to its purchase of Coin. You can use the top credit cards such as Visa, American Express, or MasterCard and link it up to Fitbit Pay, and you can also set up your debit cards from “top issuing banks”. You can also add up to 6 different payment cards into the Fitbit Pay, and the limit for Apple Pay is 8. So the Ionic got some good smart features, and having in mind that is their first attempt into the smartwatch world is a really good try, although the Apple ecosystem has a greater maturation that it will take some time to Fitbit to get there. But with time Apple is going to have a real competitor when it comes to the smartwatch world, Fitbit is a real player and the biggest on the Fitness tracker world, and now with the Peeble developers that join the company is a matter of time for them to get to the next level. So, on the smartwatch arena the Apple has a more evolved ecosystem, but when it comes to fitness tracking the Ionic just like any Fitbit device is a clear winner. Out of the box, you have running, cycling, swimming, weights, treadmill and interval training, with a special workout mode for each exercise, and the coach mode that is going to help you during your exercises. Both smartwatches include water-resistance to 50m, so you can use it for swimming even on the sea, and of course, you can take it with you on the shower. With the Ionic, you will also have the regular standard of Fitbit fitness features, just like VO2 Max, SmartTrack, and Sleep Stages. The Apple Watch, on the other hand, cant recognize as many workout modes as the Ionic. For example, it doesn’t include a mode for weights or interval training. Another downside when it comes to fitness tracking with the Apple Watch is that you cant automatically track your workouts like the Ionic does for running, and there’s no sleep tracking, either. There is one way that you can achieve this but is by using a third-party app and then having to charge your watch on the next day, so you are going to end up watch-less until is charge again. The Ionic is the second Fitbit that includes GPS built-in, after the Surge, allowing it to match the Apple Watch in this regard. When we tested out the GPS on the Ionic was really accurate and fast. The GPS on the Apple watch was also spot on. It’s true that the Fitbit’s PurePulse technology is not the most accurate when it comes to working out at high intensities. They improved the technology for the Ionic but is still not 100% accurate. Although a cool addition is the new red light and infrared sensors, which will allow the smartwatch to gauge SpO2, the amount of oxygen in your blood. 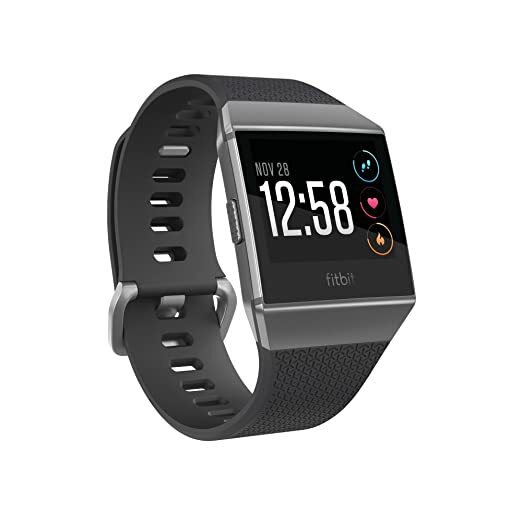 As we said at the beginning you can also use the Fitbit Coach mode that is an improved version of the Fitstar, that will allow you to choose from a wide range of workouts that Fitbit assures it will tailor to your personal needs the more you use it. So when compared with the Apple watch and the watchOS 4, that can give you some coaching but mostly to know how to close your rings, the Ionic is a clear winner when it comes to coaching and helping you improve your workouts. When it comes to the Apple watch 3 they add elevation tracking, and the watchOS 4 finally put together the resting heart rate to the platform. This latest software update brings to the table the cool addition of support for VO2 Max and support for more workouts. You can also use the Apple GymKit, that will help you with just a tap on your Watch choose the gym equipment mode that will give you a more accurate reading of your activity. Although this feature is incumbent on the equipment rolling out to gyms, which naturally takes time. But putting the Biometrics aside, the inclusion of the LTE function is the greatest fitness feature that the Apple watch has to offer, so now you can go for a run or a swim without the need of having your smartphone with you and you can still have calls and messages on your wrist, and that’s one thing the Ionic can’t do. Something else to have in mind is when it comes to each device’s companion app since you are going to be spending most of your time tracking and checking your workouts here. This is another area where the Ionic excels, having just the best companion provided by all the major players, giving you an intuitive, clean way to navigate the different areas of your tracking, whether is your heart rate history, your sleep graphs, active minutes or anything else. 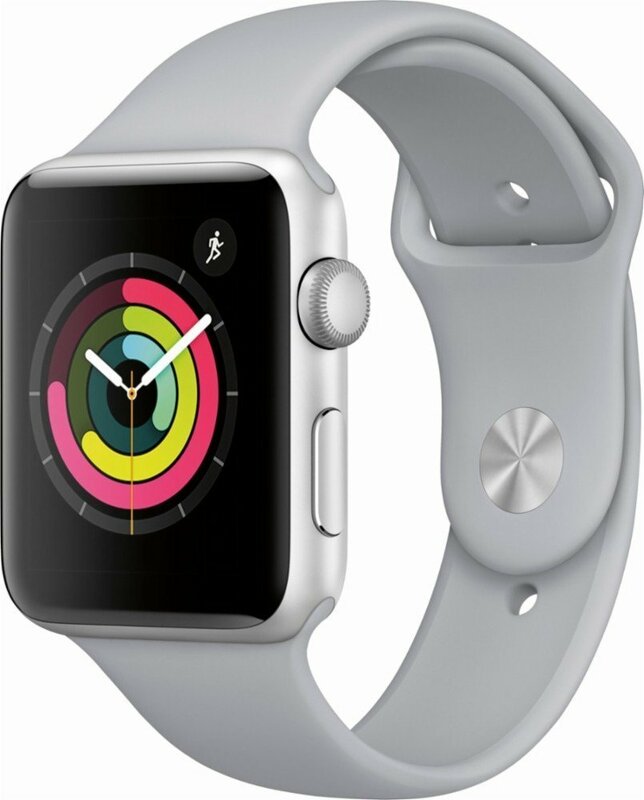 For the Apple watch all your data gathered by the Watch is instead parcelled out separately over Activity and the Apple Health app, while the Watch app is essentially your base for changing settings and updating. It’s not very reliable and it can be clunky, giving to the Ionic the upper hand on this matter. So when it comes to fitness the most important factor is about how they are going to take you to the next level. The technology on the Ionic will give you a long-term evolution, evolving with you and learning from your data to take you to any level that you wish to achieve. So without a doubt on fitness tracking the Ionic is a clear winner. When it comes to Battery life there no perfect smartwatch, with all the apps and functions that they run, is difficult to keep a strong battery lifespan. The Apple watch 3 can run for up to 18 hours with regular use, we tested and with no much use can go up to 2 days. But let’s say that you would like to use the GPS on and the LTE as well and the watch can handle up to 5 hours of juice. So not impressive at all. The Ionic can go with regular use up to 4 days what is a real difference when compared with the Apple 3 but when using the GPS on the watch can be going for only 10 hours straight. Although is two times more juice that you can get with the Ionic is still not a great battery life either. There are plenty of similarities between the Fitbit Ionic and Apple Watch Series 3. Let’s take a look at a few of the features you’ll get with either device. When you think of a watch to track your fitness you would like a tracker that can be submerged on water, but most of the trackers out there are not able to get even under the shower. On the Fitbit family, there was just one tracker able to get underwater and that was the popular Flex 2. But the good news is that the new Ionic and the latest Versa can now get under water up to 50 meters and swim tracking. The Apple Watch Series 3 can handle just the same when it comes to water resistance, can go up to 50 meters and offers swim tracking. If you buy any of this tracker you will get amazing fitness tracking features. Both the Ionic and the Series 3 can track your heart rate, both have an altimeter for measuring altitude change and counting floors, and in both cases, you will get a boast enhanced technology for each of the tracking functions. As we said before the Fitbit Ionic excels when it comes to fitness tracking, but Apple has invested in a ton of fitness tech and initiatives making the Series 3 and the WatchOS 4 technology a more fitness-focused device. Another feature that you will get with the Ionic and the Series 3 watch is the ability to connect with GPS that is built in on both trackers so you can use all the apps and tracking that require it. Having GPS built in means you don’t have to connect to your phone to track distance, pace, and so forth, and it helps ensure more accuracy on that data. So on a big intent on getting on the smartwatch game Fitbit put his game up and add the NFC chip contactless payments, so with each of this trackers now you can pay directly from your wrist. The also can handle music storage, although the space that you will get is when they differ you can get only 2,5 G with the Ionic instead of the 8 G that you will get with the Series 3. When it comes to battery life the Ionic takes the advantage, although as we mentioned in our battery section even the 4 days that you will get with the Ionic is not the greatest battery life either. But when compared, the Fitbit Ionic has the upper hand, so if you are looking for the best battery experience the Ionic is the one to choose. The series 3 battery life that can go up to 18 hours is just awful, and when using the LTE that is when you don’t want to take your phone with you and still have the smartwatch experience, you will only have 4 hours and 5 if you are lucky. The Ionic can go up to 4 days and on our test, we used it with a regular use and could hold up to 5 days as well. Here is when the Apple watch gets a clear win. The Ionic is the first try on the smartwatch world for Fitbit so the amount of apps available are lees that what you will find on the Apple ecosystem, that has been evolved over years. But the Ionic will keep evolving so whenever you realized the difference it may be not as big as today. Although is going to take years to Fitbit to get at the Apple level. So the new LTE is the big deal when it comes to using your smartwatch without a phone, although is fair to say that not all the functions can go without the phone and is not that strong as you may wish, plus you can only use it up to 5 hours without the need of a charge. So, in that case, the Apple watch has the advantage, but have in mind that it only works with iPhones so for those Android users the Apple watch is not a good partner, but the non-LTE version of the Apple watch is a cheaper option. When it comes to Apps is also a difficult call to know which one is better, since the Fitbit app is a major player when it comes to fitness tracking, can track all you different exercises and detect them automatically. The Apple Watch’s activity tracking can be supplemented by activity-specific apps, which have more focused data and motivation. When it comes to Sleep tracking the clear winner is the Ionic since there’s no sleep tracking support on the Series 3, mainly because of the battery lifespan. But the Sleep patterns that the Fitbit app can track are incredible and accurate giving you all the data that you need to improve your sleep and overall quality of life. So if you are here you probably are trying to figure it out which one is best to buy. Both smartwatches are really good and are at the top of the list when choosing the best smartwatch in 2018. The Apple watch 3 is the best when it comes to smartwatch features for iPhone users. On the other hand for those fitness focused people, the Ionic is a better pick. In terms of price, the Ionic is a bit cheaper than the Series 3 but not for much, both of this smartwatches are not budget friendly but, is impossible to get this quality and smart features for much less than this. When it comes to using the tracker without the phone the Series 3 will be the best for people looking for this feature. At the same time, the Apple watch is clearly the best smartwatch when compared, featuring a lot of apps, cooler design, and better app ecosystem with a long time on the app business. But don’t forget that it only works with iPhone so if you have an Android phone this tracker it won’t be the best fit. So at the end of the day for those looking for the best smartwatch, the Apple is the one to go, when looking for a better way to improve your overall health and fitness the Ionic has no competition. When it comes to design and apps the Apple Watch Series 3 is the best on today’s market. With a mature ecosystem that keeps evolving and a variety of colors and accessories that give you a lot of customizations. On the other hand, if you already have a Series 2 the biggest difference from the series 3 is the LTE, so there’s no need to get the latest apple watch in that case. On the Fitbit Ionic part, the first attempt by the company into the smartwatch world seems more like the first fitness tracker built for the future of fitness. If the company can achieve what they are trying to do here with the SpO2 and the sleep apnea and atrial fibrillation, plus the cool and handy Fitbit Coach that gives you in-depth information about your fitness stats, we can be watching the future of smartwatch and fitness tracking. Fitbit Comparison: What is the difference between Fitbits? Apple Watch 3 vs Fitbit Versa: Which Smartwatch is the Best?